So finally I am back to work tommorrow. 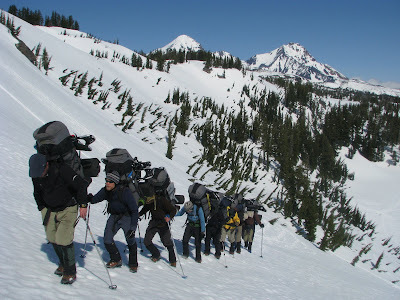 The last stint of play has been amazing, starting with a long drive to Mt Rainier with Levi and Steve to climb Liberty ridge. Unfortunately the road head was not open so we headed back to a route that Steve and I (and steve Southard) tried in 2007). 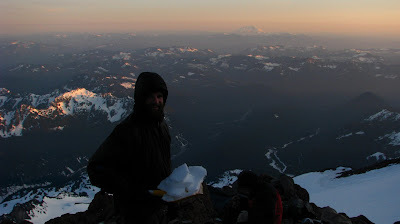 We climbed the Kautz glacier route which involved a days slogging across the Nisqually glascier and up to camp hazard at 11000 ft. a late start at 5 am saw us climbing the ice pitches in the early morning light but set us up for a late end to the day. 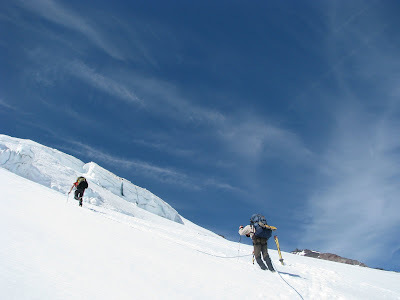 We carried over the mountain (a mission in itself but better than descending the Kautz) down the Ingraham Glacier. 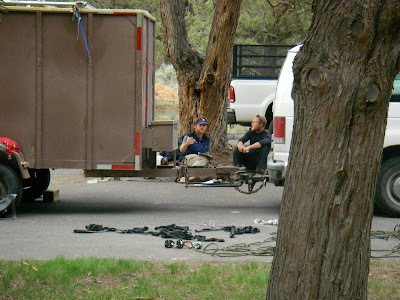 We then drove back south and since then I have been climbing at Smith rock with Steve, Ryan and Mike Mourar getting on some of the classic pieces of rock right next to where I live. 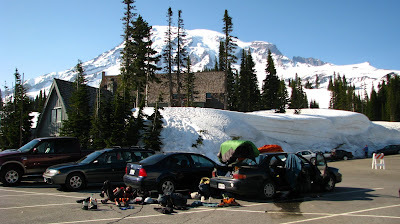 Steve stepping across the gap on the second pitch of wherever..
At the end of the slog, Mt Rainier from the car park with our car and gear – levi is napping in there somewhere. 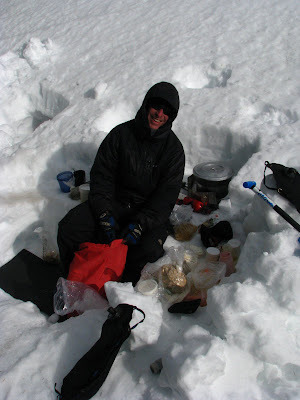 Levi with snow to melt for water at camp hazard. Levi on the “Turtle” the upper icefall on the way to camp Hazard. Where am I? – playing with the new GPS…. 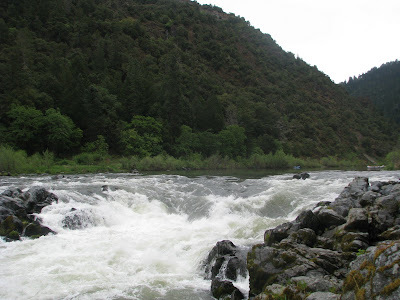 The first part of the road trip is now complete, I finished work loaded up steves truck and drove south to catch the end of the “open season” on the Rogue river. 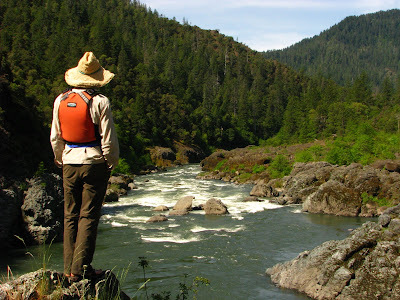 It was beautiful to down in the coastal region surrounded by trees on a stunning section of river. 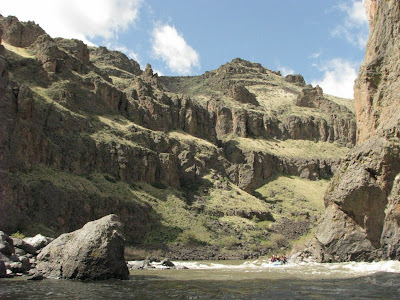 We floated the wild and scenic section (35 miles) taking three days and a minimum of stuff. 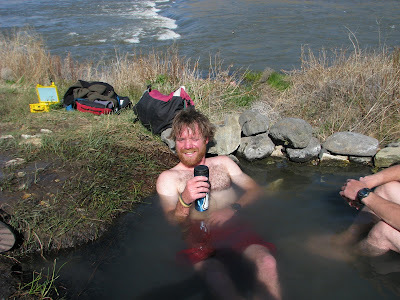 We unfortunately ran out of beer but stocked up at a lodge on the river side. 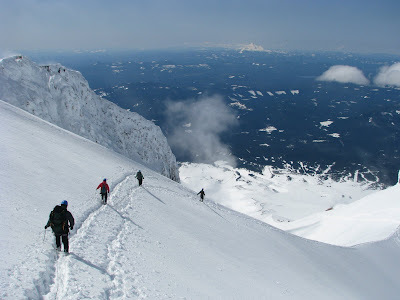 We then drove (or rather steve drove) down to Mt shasta and were soon half way up casaval ridge. 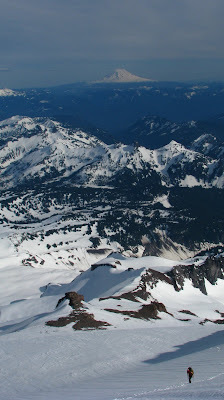 A beautiful easy ridge to the top of the second highest peak in the lower 48 states. At 13000ft we finally bumped into Rachel and Chris and their friends before summiting, heading down and grabbing a burger and beer in shasta city. 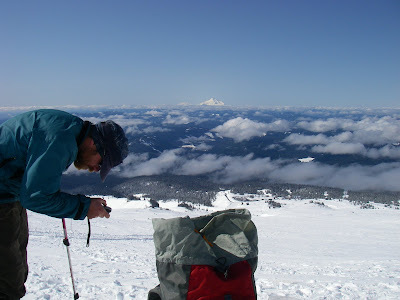 Am now back at base planning the next trip, this time heading North to Mt Rainier and Mt jefferson. 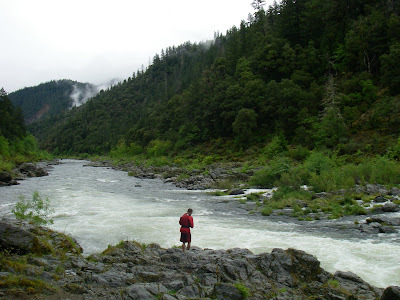 Me scouting Rainie falls (class 5) in the first mile of the Rogue – we ran the fish ladder on the right (class 3) where I managed to hit every rock possible. A better view of Rainie falls, our raft is the grey thing in the middle right side of the picture. 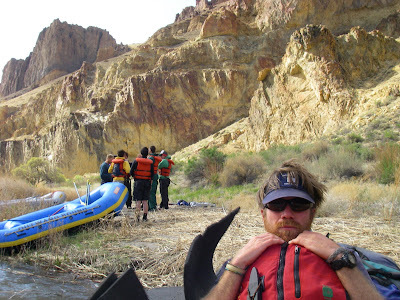 Steve scouts Blossom bar, the most technical rapid on the Rogue. 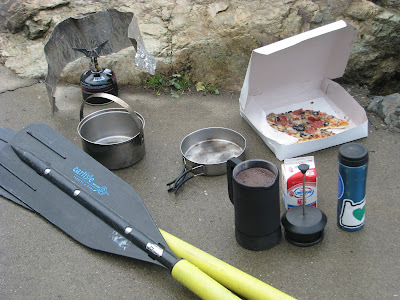 The best way to start the day, putting on the river in the rain with coffee and cold pizza. Photos continued. 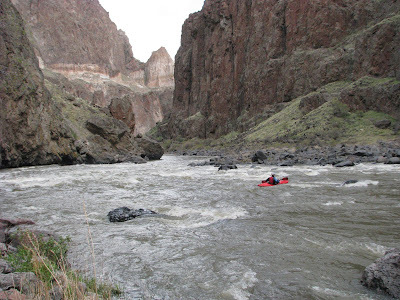 The oregon wilderness educators course has a rock climbing component at Smith rock, a Wilderness First Responder section, a river section on the lower deschutes, a mountaineering section in the sisters wilderness and lastly a finals section that contained the Owyhee river and an ascent of Mt hood. I didnt get many photos of smith or the deschutes for some reason but did get a fair few of the other sections. I worked the whole course with other staff coming in to work specific sections. It was great to be out there for the whole time and also to get to work with so many good people (we ended with 10 different staff working the course). 50 days is a long time and I was interested in how I would feel afterwards. Generally I just feel like there really is something I should be doing or someone I should be talking to but apart from that I feel energised to go on my own adventures right now. which will follow in the next post…. Chilling in the tent with meagan and steve (day 47 or 48) on mt hood. 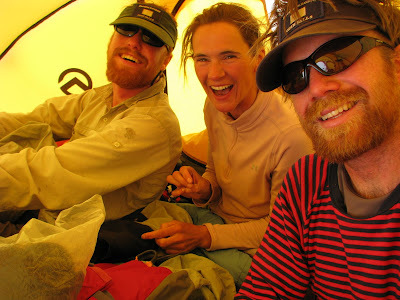 We spent a bit of tent time on hood due to a storm then from the sun. 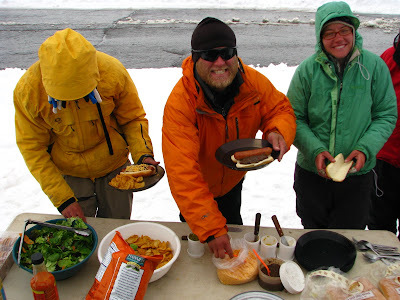 Hot dogs in the snow at Mt hood trail head (timberline). The salad kept blowing away. 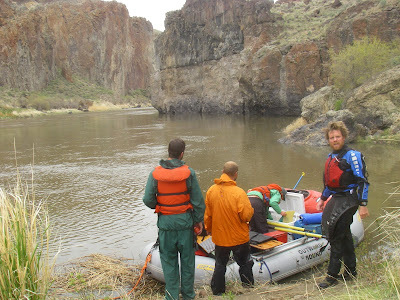 Meagan making fresh cinimon rolls on the Owyhee river. 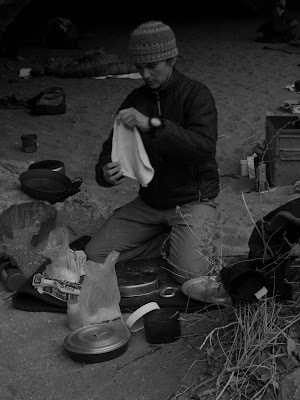 Rusty cooking in the snow kitchen, sisters wilderness. 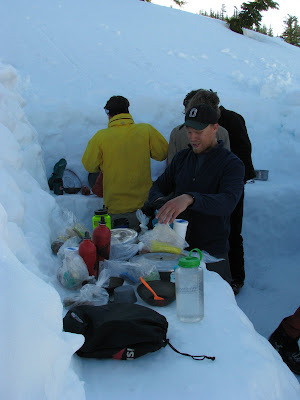 Tony sorting food in our mini snow kitchen in the sisters wilderness. The camp at illumintation saddle (on the left) with the clouds rolling past. Night 3 on the Owyhee sleeping in the cave. 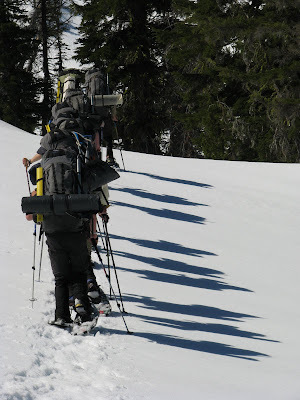 Have just finished working the oregon 50 day wilderness educators course. 55 days of work and now i find myself back at base with the feeling that i really should be doing something. So I’m going to. 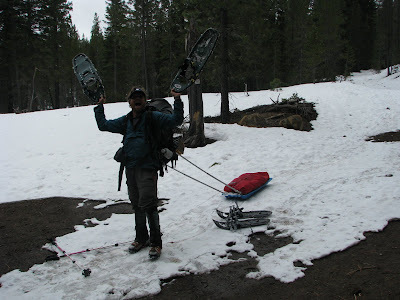 Heading off today, south down to raft the rogue (flows out of crater lake) followed by an attempt to climb Mt shasta. Here are some photos from the course though….. 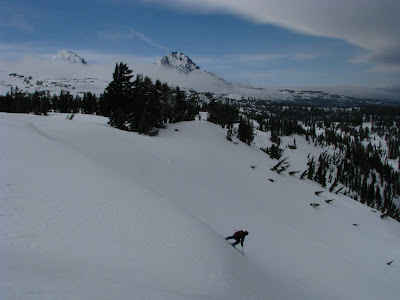 Steep snow climbing from golden lake to the zen puddles, sisters wilderness. 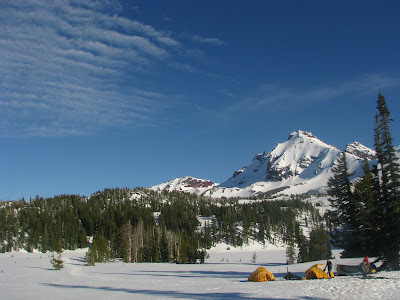 Base camp at golden lake with broken top behind. 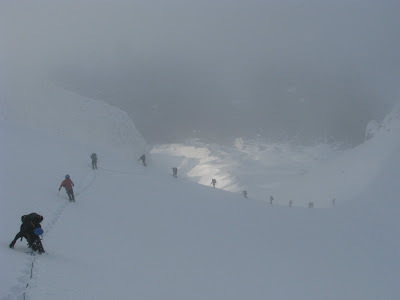 We attempted the NW ridge (the one on the right side of the mountain) but were turned back by intense cold and hard conditions. 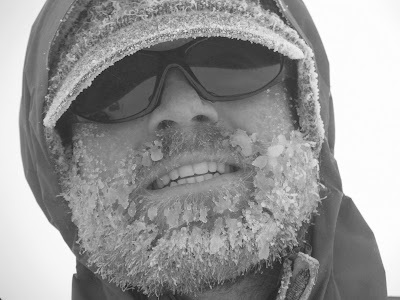 A wee bit chilly – day 46 on Mt Hood as we try and dig platforms in for the tents in the middle of a storm. 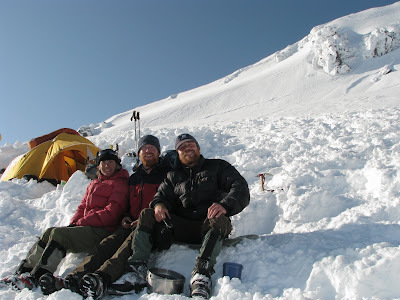 Meagan steve and I with our tent behind at illumination saddle on Mt hood Summit day – day 48, 7am and we are just above the Hogs back (well i am anyway – steve is still standing on it as the last person on the team) on the south face of Mt hood.